We knew it’d be a hit, but not that much of a hit. 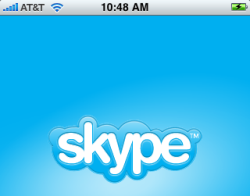 The official Skype iPhone application, announced earlier this week, hit the iTunes Store last Tuesday and since then it’s seen an astonishing one million downloads to the popular Apple devices, which is nothing short of amazing. That translates to approximately 6 downloads per second. In the blog post announcing the milestone, Skype blogger Peter Parkes says he’s “confident that it’s one of the fastest-downloaded iPhone apps ever”, which means he’s not really sure. And since we don’t know either, we’re reaching out to you, dear readers. Does Skype now hold the record for reaching the million download mark fastest for a free app, or not? (Hat tip to Pat Phelan).